This is another one of those recipes that takes the simplest ingredients, and transforms them into something unexpected. I came across this one on Smitten Kitchen, which is my favorite food blog. 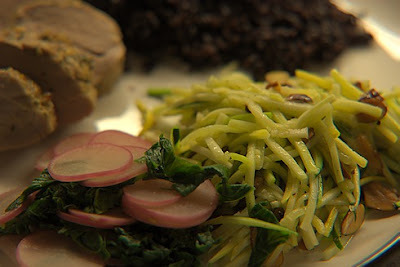 The julienne cut of the zucchini is essential here, because the toasted almonds get caught among the zucchini strands. I've tried cooking veggies with almonds before, but the almonds inevitably fall to the bottom of the dish, no matter how much I toss the mixture -- that is not a problem here. The julienne is no problem if you have the right tool, but I imagine it would be a real pain with just a knife. The original recipe has the option of adding cheese, but I think it's better without. The amounts are really variable here -- any amount of zucchini and almonds will come out fine, so adjust to your taste. Heat the oil on high heat in a skillet. When it is hot but not smoking, add the almonds. Cook them, while stirring, until the almonds are golden-brown, approximately a minute or two. You want them nicely toasted and crunchy, but not burned, obviously. Add the zucchini to the pan, tossing it with the oil and almonds until it is just heated through, about one minute. The short cooking time is important here -- you want the zucchini to retain some crispness.